Many adolescents engage in risk behaviors such as substance use and aggression that jeopardize their healthy development. This study tested the hypothesis that an authoritative school climate characterized by strict but fair discipline and supportive teacher–student relationships is conducive to lower risk behavior for high school students. Multilevel logistic regression models were used to analyze cross-sectional, student-report survey data from a statewide sample of 47,888 students (50.6 % female) in 319 high schools. The students included ninth (26.6 %), tenth (25.5 %), eleventh (24.1 %) and twelfth (23.8 %) grade with a racial/ethnic breakdown of 52.2 % White, 18.0 % Black, 13.1 % Hispanic, 5.9 % Asian, and 10.8 % reporting another or two or more race/ethnicities. 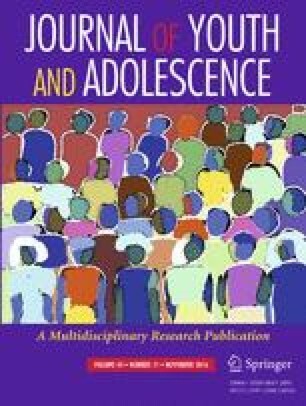 Schools with an authoritative school climate had lower levels of student-reported alcohol and marijuana use; bullying, fighting, and weapon carrying at school; interest in gang membership; and suicidal thoughts and behavior. These results controlled for demographic variables of student gender, race, grade, and parent education level as well as school size, percentage of minority students, and percentage of low income students. Overall, these findings add new evidence that an authoritative school climate is associated with positive student outcomes. We thank Donna Michaelis and Jessica Smith of the Virginia Department of Criminal Justice Services and Cynthia Cave and Jo Ann Burkholder of the Virginia Department of Education for their support of the Virginia Secondary School Climate Study. We thank members of the project research team including Juliette Berg, Pooja Datta, Anna Heilbrun, Joy Yuane Jia, Timothy Konold, Marisa Malone, Patrick Meyer, and Xiaoxin Wei. This project was supported by Grant #2012-JF-FX-0062 awarded by the Office of Juvenile Justice and Delinquency Prevention, Office of Justice Programs, U.S. Department of Justice. The opinions, findings, and conclusions or recommendations expressed in this publication are those of the authors and do not necessarily reflect those of the Department of Justice. DC conceived of the study, participated in its design and implementation, and drafted the manuscript. FH participated in the design and implementation of the study, conceptualized and carried out the data analyses, and helped to draft the manuscript. Both authors read and approved the manuscript. The survey data used in this study were collected anonymously from students by school personnel as part of school procedures to comply with the state’s annual school safety audit. Parents were informed of the survey and given the option to decline participation for their child. School demographic data were obtained as aggregated school level totals from school records with no identification of individual students. Allison, P. (2012). Why you probably need more imputations than you think. Retrieved from http://www.statisticalhorizons.com/more-imputations. Centers for Disease Control and Prevention. (2015). Youth risk behavior surveillance system. Retrieved from http://www.cdc.gov/healthyyouth/data/yrbs/index.htm. National Gang Center. (2015). National youth gang survey analysis. Retrieved from https://www.nationalgangcenter.gov/survey-analysis. U.S. Department of Justice and U.S. Department of Education. (2014). Dear Colleague letter on the nondiscriminatory administration of school discipline. Retrieved from http://www2.ed.gov/about/offices/list/ocr/letters/colleague-201401-title-vi.pdf. Venables, W. N., & Ripley, B. D. (2002). Modern Applied Statistics with S (Fourth). New York: Springer. Retrieved from http://www.stats.ox.ac.uk/pub/MASS4.